According to a new study ,Birth Control May Alter The Structure Of A Woman’s Brain. The study was published in the journal Human Brain Mapping. 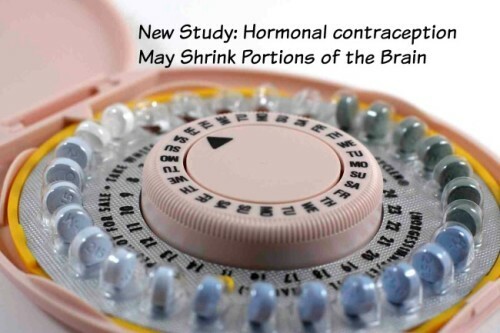 The study took place on 90 women, in which neuroscientists at UCLA found that two key brain regions, the lateral orbitofrontal cortex and the posterior cigulate cortex, were thinner in women who used oral contraception than in women who did not. The lateral orbitofrontal cortex plays an important role in emotion regulation and responding to rewards, while the posterior cigulate cortex is involved with inward-directed thought, and shows increased activity when we recall personal memories and plan for the future. This is interesting because of how many women are affected emotionally by taking Hormonal Contraception. Scientists have not yet determined if these neurological changes are permanent, or if they only last while a woman is on the Pill. Either way this is not good news because of how delicate the brain is. Oral Contraceptives have been in the news recently for many negative side effects such as Increasing the Risk of Breast Cancer and even occurrences of rare brain tumors. Whether it’s the news or women trying to take a healthier alternative to their Birth Control needs many women are starting to opt for more natural family planning options. It’s important to research the effects that these contraceptives have not only on our bodies before committing to use. That’s frightening. I need all the brain I can get. Wow! Glad I’m not taking these any more ! Suppressing a woman’s natural fertility hormones long-term just seems counter-intuitive. Every once in a while a study comes out with yet another documented (and unexpected) side effect from hormonal contraceptives. I know firsthand from speaking with many women that side effects are not adequately addressed when the pill is prescribed. Nor are most women informed of the fact that the pill not only prevents ovulation, but can actually prevent implantation of a newly conceived baby (when “breakthrough ovulation” occurs). Education is crucial! I couldn’t agree more. It worries me how freely and easily these contraceptives are prescribed and people don’t realize how dangerous they are. I’m glad these studies are coming to light and informing people of these dangers. And a lot of women say “I’ve been taking it for years with no problems,” but that doesn’t discount the fact that there are many well-documented side effects, some of them even serious enough to cause death. I just wish women were better informed, especially since the pill is so routinely prescribed. Plus, no one has done any research on the long term effects that they have on teen girls. In spite of that hormonal contraceptives are being prescribed routinely to young girls when they’re periods are heavy, irregular, painful or anything else. My sister’s best friend started taking the pill at 15 because of COPD and when she quit after she got married she couldn’t get pregnant. No one treated her underlying issue. They just put a bandaid on it and sent her out the door.